I love soup. I don't think soup should only be eaten when it is cold. In light of Easter yesterday I thought this recipe was perfect. Ok carrots don't really have anything to do with Easter, more the Easter bunny, but since I am a huge fan of Easter egg hunts I think that carrots do have a place in Easter! This soup definitely has a carrot flavor. 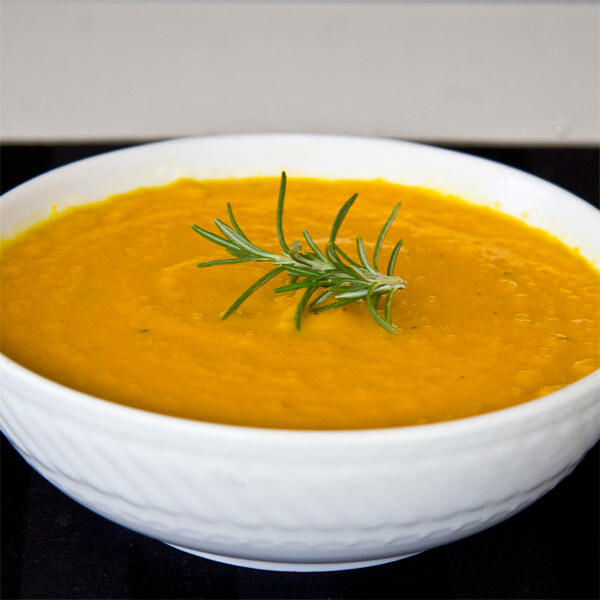 If you aren't a hug fan of carrots, then this soup might not be for you. 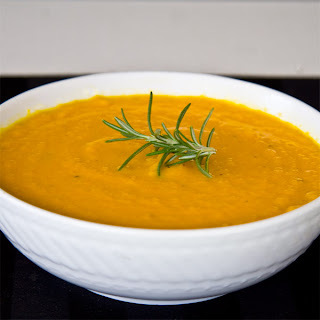 If you do enjoy carrots then this soup is definitely worth a try. The flavor is unique, but I love the carrot and rosemary combo. I am also pretty excited about how healthy this soup is! Place oil in large pot over medium heat. Add carrots, onions, garlic, thyme and rosemary. Cook for 15 minutes, until carrots are fork tender. Remove herb sprigs and transfer carrots and vegetables to blender (I used our Kitchen Aid blender). Puree, using the soup button if you have one. Add chicken broth and continue to puree. Transfer to large saucepan over medium heat and add bacon strips. Season with salt, pepper and hot sauce. Simmer until ready to serve.